This Breitling Premier B01 Bentley has been designed to celebrate Breitling's partnership with one of the greatest names in luxury motoring. 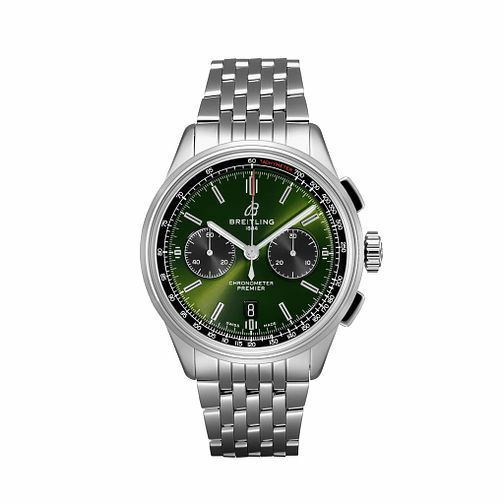 The British racing green dial is beautifully contasted by the black chronograph counters, and the Bentley logo has been placed on the transparent sapphire crystal caseback, through which you can see the chronometer-certified self-winding Breitling Manufacture Caliber 01 - a movement that is able to deliver a 70 hour power reserve. At 42mm, this watch is a combination of style and meticulous craftsmanship that both Breitling and Bentley are famous for. Seen here on a classic seven-row bracelet, the Breitling Premier B01 Bentley is also available on a green nubuck leather strap.